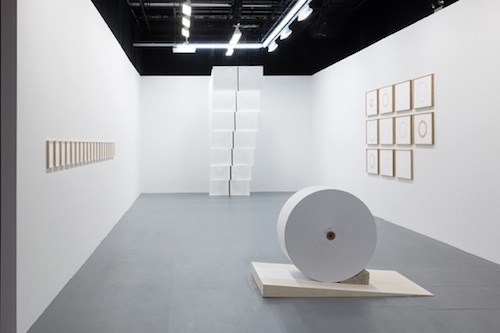 View of “this single monument,” 2014. Luke Stettner’s current exhibition, “this single monument,” includes ten discrete works. Their austere aesthetic (they look almost clinical) belies the emotional heft of their makings—the bodily and baroque made sterile. Each piece also shares the same name as the exhibition, which has been taken from John Ashbery’s 1962 poem “These Lacustrine Cities.” The existential themes that are at the backbone of the poem are condensed within the works. this single monument (all works cited, 2014) combines sentences excerpted from letters penned by William Carlos Williams over some five decades. Stettner has presented the sentences he selected as a single letter across nineteen individually framed sheets, which together chart his correspondence and reflections. The work is especially poignant at a time when handwriting seems a dying craft—language no longer transmitted by an inky pen on parchment but by virtual letters on a LED screen. Hanging on a nearby wall is a curious stain of dried liquid on paper, this single monument (impression), which was formed by dropping a placenta onto the paper. On the floor is a Plexiglas shelf, which has been covered with an even layer of gray powder—the triturated remains of an urn that previously held Stettner’s father’s ashes. Elsewhere are eleven framed drawings this single monument (circles): Presented in a grid, each contains a circle that was formed by attaching the paper on cardboard to a potter’s wheel and applying clay slip. The process evokes the artist’s hand in the act of making, while the rings convey Ashbery’s notion of the “eternal cycle” of history—but like the aforementioned works, it looks almost antiseptic, if poetically so.